Redesigning your bathroom is an excellent way to get a little luxury and style into your home. It’s also a pretty major undertaking though. Whereas decorating a living room might mean some paint or wallpaper, redoing a bathroom means that you need to deal with plumbing. Choosing the right fixtures and fittings for your space is essential; you need to make big decisions on baths, showers, sinks and toilets. Pillar Taps: These are the traditional taps that you see in older bathrooms, they are always two separate devices for hot and cold. They may add a touch of retro elegance to your bathroom, but there is that inconvenience of having a hot and a cold tap, rather than getting warm water from one tap. High Neck Taps: An ordinary tap usually has water come out around 22 mm above the base of the tap, a high neck tap on the other hand is taller and has its water spout a minimum of 95 mm above its base. These taps were originally designed for kitchen use, but are starting to make an appearance in bathrooms too, as they tend to be sleek and modern looking. The downside of a high neck tap is that you must have a large sink, as the water tends to disperse over a larger area. Lever Taps: By far the most common kind of tap seen in bathrooms nowadays, lever taps lift a lever on the top of the tap to control water flow whilst also turning the lever from side to side to control temperature. 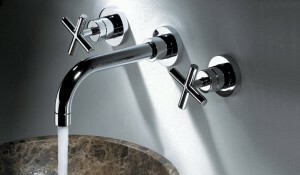 They are generally mixer taps, and conveniently mix cold and hot water together. They also come in a range of sleek looking styles and a variety of prices, making them flexible for every budget. Water Saving Taps: A water saving tap restricts the flow of water from a tap, thereby saving water and money. In modern homes with good plumbing and wide, clean pipes a water saving tap should save you money on your water bill without having a hugely noticeable effect on the tap’s performance. However, if your home is older with pipes that have restricted water flow already (generally due to limestone), or if your bathroom already has low water pressure, then water saving taps are not recommended. In these circumstances restricting your water flow even more may mean that you get no more than a trickle of water from your tap. Ceramic Washers: Modern taps may come with ceramic washers, which become smoother and therefore more water tight over time, saving you the need to change washers. This is great. However, in locations that have hard water you may find that lime-scale will affect the performance of these washers, and cause you to have to replace the tap. Phil Turner has had to rebuild one bathroom in the past year and has plans for another one. He decided to follow QS Supplies on Twitter after buying QS bathroom taps for the first bathroom and being very pleased with the result.